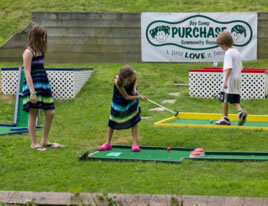 The Purchase Community House provides recreational and enrichment programs for the residents of Purchase and surrounding communities. Anyone eligible to attend Purchase Elementary School is considered a "Purchase Resident" even if their mailing address is West Harrison or Rye. We provide pre-school and after school programs during the school year, an eight week day camp for ages 3 to 15 and an outdoor family pool program in the summer. The PCH is a Not For Profit Corporation supported entirely by user fees and donations. Click here for a copy of our By-Laws. The center of community activities in Purchase is the Community House. Mr. William A. Read first recognized the need for club rooms where the people of Purchase could come together for social and for civic purposes. On October 7, 1915 he informed the Purchase Property Owners Association of Harrison Township, Inc. that he had bought a saloon on Purchase Street, and that he intended to buy additional land which he would present to the Community for the above purposes. He planned to build on this property a Community House which would contain an auditorium, living quarters for a neighborhood nurse and for school teachers, and a gymnasium for men and boys. Death intervened before Mr. Read could carry out his plans. His widow erected the William A. Read Memorial House. Upon its completion it was leased to the Purchase Property Owners’ Association, which undertook its management and maintenance. After the association cancelled the lease, an organization known as the Purchase Community was formed, largely through the efforts of Mr. Carl Pforzheimer. Mr. Louis B. Ralston was first president of the Purchase Community, and Mr. Carl H. Pforzheimer was its first treasurer. The Community House was leased to the Purchase Community for five years at an annual rent of $1.00 per year on April 1, 1919. Mrs. Read paid the salary of the Director. Other operating expenses were paid for by the Purchase Community from memberships and donations. Upon incorporation of the Purchase Community in 1926, title to the Community House was transferred to the Corporation by Mrs. Read. It was Mrs. Read's request that the Community House be used to foster fellowship among Purchase Residents, and for wholesome activities which unite the neighborhood in loyalty and service to the community, the state and the nation. 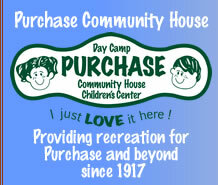 Today, the Purchase Community, Inc. still manages and operates the Community House. Members of the Purchase Community, Inc. elect a Board of Directors at the annual meeting. All residents of the area defined by the Purchase School District who are age 21 and over are Members of the Purchase Community, Inc. and are eligible to vote at the annual meeting.